Reiki is a technique that aids the body in releasing stress and tension by creating deep relaxation. Because of this, Reiki promotes healing and health. The word Reiki is made of two Japanese words – Rei which means “the Wisdom of God or the Higher Power” and Ki which means “life force energy.” The Reiki system of healing is a technique for transmitting this subtle energy to yourself and others through the hands into the human energy system. Reiki restores energy balance and vitality by relieving the physical and emotional effect of unreleased stress. It gently and effectively opens blocked Meridians, Nadis and Chakras, and clears the energy bodies, leaving one feeling relaxed and at peace. The aura is a beautiful field of ever changing energy patterns that completely surrounds all living things. Some people are clairvoyant and have the ability to see the aura. The oval shape surrounding the figure symbolizes the aura. The aura is composed of many layers starting with an inner layer closest to the body and ending about 4-5 feet from the body. Even higher layers can exist further out than this. Each layer represents a different part of the persons consciousness with the inner layer connected to the physical body followed by higher layers including the emotional, mental and spiritual layers. The aura is created by all of your thoughts and feelings, both conscous and unconscious as well as the energies flowing through the physical body. Your state of health is affected by the condition of the aura and in fact many feel that the original cause of both illness and health is in the aura. 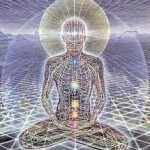 Treating the aura with Reiki can be an important part of a Reiki session. The seven main chakras are represented by the flower shaped images on front of the previous figures. The chakras are actually transformers of subtle energy. They take the universal life energy that is always around us and transform it into the various frequencies our subtle energy system needs to keep us healthy. The lowest or root chakra brings in the lower frequencies that are needed for physical survival and the highest or crown chakra brings in the spiritual levels of energy. Each chakra corresponds with a layer of the aura. Negative feelings or thoughts can become lodged in the chakras reducing the amount of subtle energy they are able to provide and adversely affecting ones health. 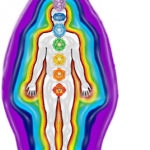 Treating the chakras can also be an important part of giving a Reiki treatment. The meridians are represented by the lines and dots on the right figure. They are pathways that subtle energy flows through within the physical body. 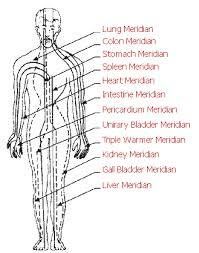 The meridians contain energy points usually referred to as acupuncture points. Each meridian is usually associated with an organ or physical system of the body, and supplies that organ or system with subtle life energy. As an example, the liver meridian starts on the top of the foot and travels up the leg. Nadi in Sanskrit derives from the word nad which means flow, motion or vibration. Nadis are the energy pathways of the body and there are 72,000 of them in our subtle body and connected by the chakras, which charges the nadis. 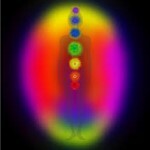 The chakras function as valves, regulating the flow of prana (prana is also known as energy or life force). Through the nadis and chakras the prana is delivered to every cell of the body and this is enhanced through the breath, the asanas in yoga, and in giving and receiving Reiki. 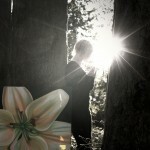 Massage, Swedish, Hot/Cold Stone Massage, Reiki, Breathwork, Facials in Sechelt and on The SunShine Coast B.C.